The self-supporting framing is the cheapest and most functional solution to hang and store meat in cold rooms without drilling cold room panels. It is widely used in butcheries, supermarkets, professional kitchens and restaurants. Our framings for meat are made from anodised aluminium alloy and developed with our exclusive design. The result is a high quality, stable, robust, elegant and hygienically safe product. A wide variety of interchangeable components are designed to offer custom-made solutions and to satisfy any clients’ need. 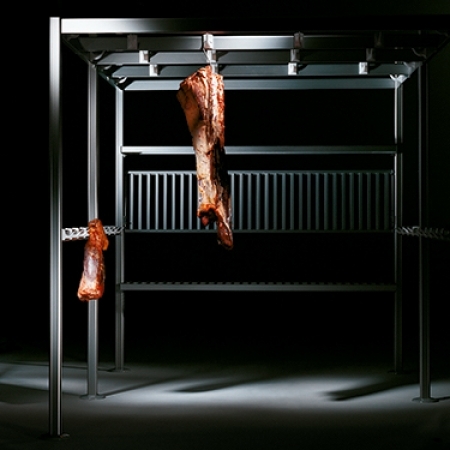 The well-tested foldable system is specially meant to install hooked bars for meat hanging between the uprights, thus allowing to cater space also in small refrigerated cells and making assembly very quick and easy. The materials of our framings have been tested in cold rooms up to – 30°C. All our equipments comply with European requirements on food contact materials.